Grush Inspections, LLC has decades of combined experience inspecting homes and commercial properties in the Reno, Sparks and surrounding areas. Property inspections are critical whenever buying or selling a home or business. Many of us know that testing the HVAC, electrical and plumbing features of a property is a good idea. Fewer of us have considered a radon test as part of the larger property inspection. In this article we identify what radon is, how it enters a property and why buyers and sellers would want to know radon levels. Radon is a tasteless, odorless and colorless radioactive gas that comes from decaying uranium in rock, soil and water. Uranium in the ground can be naturally occurring or placed there by people. Radon gas is harmless when dispersed in the open air, but when particles accumulate in a sealed environment, they can become entangled with dust particles and then inhaled by people. The EPA identifies “unsafe” radon levels as 4.0 pCi/L or higher. Because radon is a gas, it can enter your property through small cracks in the foundation and leaky pipes. Areas of a property most susceptible to radon are the lowest levels including basements, crawl spaces and first floors. 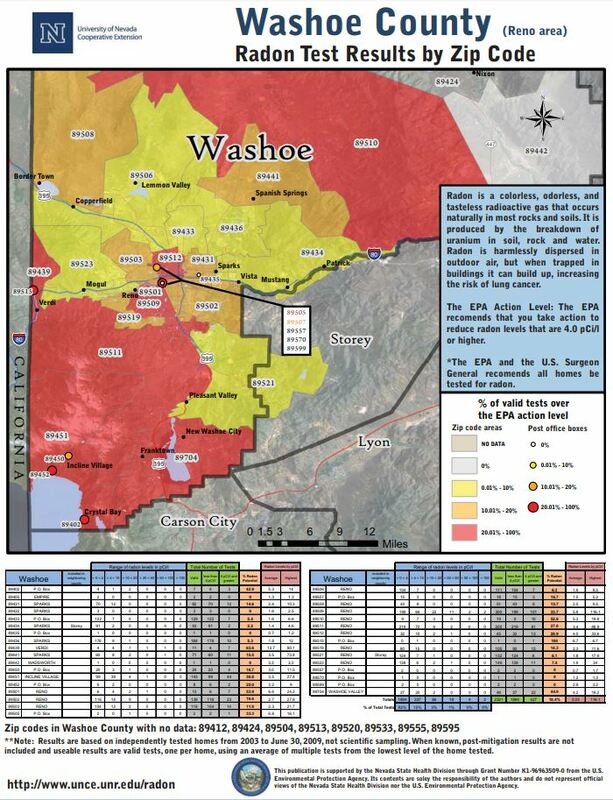 Does Washoe County Have High Radon Levels? Although small amounts of radon are present across the United States, some areas are affected more than others. According to independent testing results compiled by the University of Nevada Cooperative Extension, certain zip codes in Washoe County have tested higher for radon than others. Following is a visual representation of those results collected from 2003 to 2009. Do I Really Need Radon Testing? Some property buyers and sellers may wonder, “Is radon testing really necessary?” Statistically, most U.S. citizens are not in danger of harm from radon gas. The perception of danger, though, is absolutely a relevant factor in a property’s value. If you, the seller, can grant prospective buyers peace of mind via inexpensive, non-intrusive, non-destructive testing, why not? In most cases, the testing method will be a canister or machine left in the lowest habitable area of a property for two days. At the conclusion of the two days, the canister or machine will be measured for radon levels. If the tested radon levels raise concern, Grush Inspections can put you in contact with mitigation specialists. Contact Grush Inspections at 775-323-1117 for a radon inspection near me.